Out of 60 million population living in the Lower Mekong Basin region, 80 % of them directly rely on the river system for their food, agriculture production and livelihoods. Rice is the most important crop in this region. With several challenges faced like drought and uncertainty in rainfall are considered hazard in this region. Due to water shortages in the dry season, agricultural productivity is low and farmers in this region are the most likely victims of climate change and extreme weather events. The main objective of this project is to focus on farmer participation by educating farmers about System of Rice Intensification (SRI) practices and building strong farmer’s network at community level. In contrast with the traditional method of rice cultivation, SRI techniques require less water, seed, manure and labour and promises higher yield returns. Some major activities include exchanging ideas on new or alternative agroecological farming techniques, developing low cost location-specific technologies with profitable harvesting and increasing economic opportunities with better market needs for rainfed farmers. With the support of ministries and governmental agencies in all 4 project countries, Cambodia, Laos, Thailand and Vietnam, this project functions well in building capacity and confidence among farmers. In addition, the project also focuses on increasing knowledge about farm and crop management with increased crop yield, productivity and profitability for poor farmers. The project also provides common platform for research based learning opportunities to farmers, trainers, researchers and other stakeholders from local to regional level. In the coming years, the project expects better results from higher crop productivity to profitability which will ensure farmers participation and continuous learning process. In recent years’ crops are increasingly suffering heavy losses due to increasing biotic stresses caused by native and/or invasive species. The spatial and temporal distribution of weather variability, changing production methods and periods all are adding to this. At one hand, there is growing demand of clean and safe produce both for domestic and international market while at other there is rapid increase in the use of agro chemicals. Newer pathways and understanding are the need of the hour to manage these biotic stresses. Novel research on plant volatile emissions due to climate stresses is one of the newer frontier research area of ACISAI Center. The Center aims to strengthen Integrated Pest Management (IPM) that has evolved from a mix of various technical components to a farmer-led program. Successful IPM has always followed an ecological approach while balancing the farmers’ needs to control the pests. The decline of chemical control paradigm was as a result of inability to successfully handle the problem of resistance, resurgence and secondary pest outbreaks, along with environmental and health hazards. Alternatives to the chemical paradigm developed. The most successful of these was IPM. This approach encouraged the development of non-chemical methods that promoted the growing of a healthy crop and at the same time protecting from natural enemies, thus ensuring a low population of pest species. A participatory approach towards IPM demands that farmers need to be educated in the language of ecology to better appreciate the advances in an ecological pest management approach. 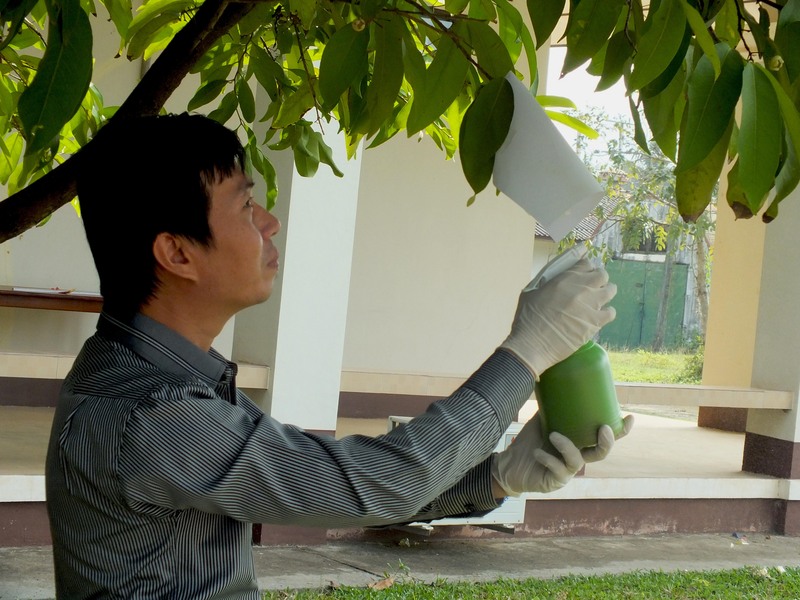 In the last decade or so, advances in IPM in a number of Asian countries took the form of farmer education through Farmer Field Schools (FFSs) and follow-up activities.